Michael Chabon’s 2000, Pulitzer Prize winning The Amazing Adventures of Kavalier and Clay, is a brilliant piece of Americana. Telling the story of two immigrants through the lens of the mid-20th century comic book binge, the only thing topping the prose was the earnestness and relevancy of the humanity portrayed to the culture it sprang from. Sixteen years later, Chabon proves the 20th century is still a major go-to for his work. Moonglow published in 2016, it brings to the table every ounce of Chabon’s prose talents and understanding of the human soul through the lens of a country’s history which helped shape its today. A personal, largely biographical parallel to his own grandfather’s experiences and adventures growing up in the US throughout the 20th century, dying in the 80s, Chabon once again uses language in rich, clever fashion to tell a story with whole heart. Moonglow is character and story driven. Switching time frames between brilliantly detailed set pieces, the reader gains a patchwork understanding of what made grandpa Chabon tick, his effect on the future generations of his family, and the cultural and social spheres encountered just beyond the personal. Grandpa’s obsession with spaceship models, his meeting with a rector in Germany amidst the final days of WWII, his hunting of a python at an old age community in Florida, the first time he met his future wife, his throwing of a cat from an upper floor window—these and many other scenes show a truly talented writer at work. Taking the quotidian and making it uniquely human for the delicate quirks of the people involved, indeed, Chabon’s talent is one many writers dream of but so few have. Reticent throughout his life, Moonglow is triggered by grandpa Chabon’s sudden discovery of cancer and the large doses of pain meds which serve to loosen his tongue in the aftermath. The narrator (ostensibly Chabon himself) subsequently hears more about the quiet old man in his final 10 days than the entirety of his life. Deceivingly anecdotal, the stories which result feel tied to an invisble balloon that slowly fills with air, buoying the narrative into the atmosphere as the pages turn. Thus, for as dynamic as the individual stories are, the sum total is the resonant portrait of a man and the reality of humanity, for better and worse, radiating from him and his family. Lacking superficial drama, the final pages are as poignant as can be. 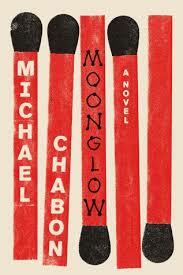 In the end, I doubt Moonglow will be the novel Chabon is remembered for. I suspect The Adventures of Kavalier and Clay will likely continue to be that novel. However, this in no way detracts from what Moonglow achieves. Positively contributing to Chabon’s oeuvre as whole, the novel is a strong work—effortlessly readable for the fertility of prose and humanity innate to the characters and their situations. As 20th century Americana starts to fade from the literary radar, Chabon proves there is still room to tell rich, worthwhile story. A couple of weeks ago my wife and I went to a talk by Chabon at the university. She was a fan I had not read anything by him. I was really impressed by his discussion of how several events in his life influenced his worldview and his work. Since then I have read several of his short stories and essays. I have been very impressed with his use of language. I also like his incorporation of genre tropes. I am pulling his novels out of the basement to give them a read.